Schwab has combined the tools of optionsXpress with our own specialized support, expert insights, and proprietary and third-party research to offer a truly innovative trading experience. It all comes at an exceptional value at $4.95 per online trade plus $0.65 per contract. See pricing details. Schwab rated "Best in Class" for options trading by StockBrokers.com, 2018. Open a Schwab Trading Services account online. Get 500 commission-free online equity and options trades for two years. Power your options trading with our premier tools. 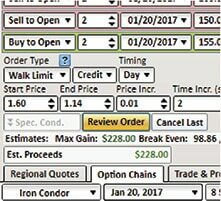 Quickly generate trade ideas based on specific goals and screening criteria, updated throughout the trading day. Whether you’re bullish, bearish, or neutral, Idea Hub canvases the market for ideas based on volatility, earnings, and income-based strategies. Gauge the potential investment risk and reward of an order before placing the trade with this sophisticated options calculator. You can also see how changes in volatility, moves in the underlying stock price, and other pricing factors could affect your trade value over time. Quickly react to market conditions by buying or selling up to four different options simultaneously with the All-In-One Trade Ticket. 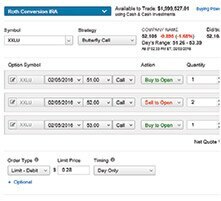 In addition to stocks and ETFs, this powerfully flexible order entry tool allows you to trade the following options order types: rollouts, write/unwind, collars, straddles, spreads, butterflies, condors, iron butterflies, iron condors, box spreads, combo, and customs. Eliminate the time-consuming process of manually modifying limit orders when trying to get the most favorable fill price between the bid and the ask. Walk Limit automatically adjusts the limit price for single- and multi-leg options orders to try to obtain a favorable execution price within the bid/ask spread. 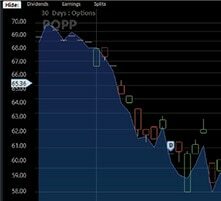 Identify trends and analyze potential options trades with advanced charting tools. Add implied and historical volatility as studies to the underlying chart to discover when option prices may be under- or overpriced relative to history. 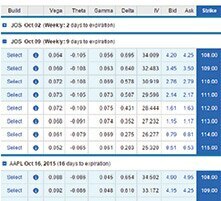 View options chains with real-time quotes for each leg of virtually every option strategy. You can also determine an option’s intrinsic and time value, build complex spreads, add Greeks and implied volatility, and proceed to quote detail or the trade ticket in just one click. Explore these additional options trading tools and features. 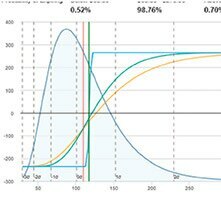 Measure factors that influence the price of an option—including time decay, implied volatility, and more—with Greeks calculated using a theoretical option pricing model and built directly into the options chain. Stay on top of options trading opportunities as they occur with dynamically updated stock and index prices that appear in real time. Manage every aspect of your options trade—from entry to exit strategy—with contingent orders. Speak with experienced options trading specialists who can really talk options. All of our options specialists are dedicated to using their advanced, in-depth knowledge of equity and derivatives trading to help you succeed. Options specialists are available to help 8:30am — 5pm ET, Monday — Friday. Build your options trading knowledge. Cultivate your skills and learn new ones with options education designed for traders of any experience level. Progress through the self-directed Learning Center with specialized paths for key options trading concepts and strategies, and how to trade options using our tools and platforms. Receive options education in a group setting through in-branch workshops, virtual events, and live webinars. Access an online forum exclusively for Schwab traders. Exchange trading ideas, tactics, and platform tips with over 10,000 traders. Stay on top of your options trading with expert market commentary and insights. Get inside the minds of our experts as they share their thoughts on recent market activity. Watch Randy Frederick's Schwab Market Snapshot video series each week for his thoughts on the past week and what to expect next. Join Chartered Market Technician Lee Bohl in his weekly webinar series "Charting the Markets" as he shares his technical analysis perspective. 1. Available with StreetSmart Edge. There is no guarantee that execution of a stop or trailing stop order will be at or near the stop price. Charles Schwab & Co., Inc. (Member SIPC) ("Schwab") and optionsXpress, Inc. (Member SIPC) ("optionsXpress") are separate but affiliated companies and subsidiaries of The Charles Schwab Corporation. Idea Hub offers self-directed investors the ability to explore new trading ideas for options that are determined based on pre-set screening criteria. Please note that Idea Hub does not consider open orders, existing positions, or other factors, and is solely intended for educational and informational purposes. The examples within the Idea Hub are not intended as recommendations to buy, sell or hold any particular security nor implement any particular strategy. 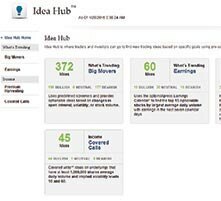 Users of the Idea Hub should not make investment decisions based solely upon the ideas generated by this tool. You are solely responsible for your investment decisions, and should carefully evaluate the examples to help determine whether or not they are right for you based on your own personal situation. The use of this tool does not constitute an investment recommendation by Schwab, and should also note be considered financial, legal or tax advice. Where specific advice is necessary or appropriate, Schwab recommends consultation with a qualified tax advisor, CPA, financial planner, or investment manager. The projects or other information generated by Idea Hub regarding the likelihood of various investment outcomes at expiration are hypothetical in nature, do not reflect actual investment results and are not guarantees of future results. The above calculations do not take into consideration all costs, such as commissions, taxes and margin interest which may impact the results shown and users of Idea Hub should not make investment decisions based solely upon values generated by it. Please contact a tax advisor for the tax implications involved in these strategies. The illustration depicts the Potential Profit or Loss of one contract at expiration. Values below zero represent a loss. The All-in-One Trade Ticket® is available on Schwab.com and StreetSmart Edge®. All-in-One Trade Ticket is a registered trademark of optionsXpress Holdings, Inc., and is used here with permission. In order to trade 3- and 4-leg options on StreetSmart Edge you must be a Schwab Trading Services client and have level 2 or 3 to trade advanced options strategies at Schwab. Call 800-435-9050 for more information about your account's eligibility or to request access. StockBrokers.com: "2018 Online Broker Review," published February 20, 2018. Participation in the review is voluntary; a total of 13 online brokers submitted themselves for ranking for the 2018 review. The Online Broker Review assesses participating online brokers on 292 variables across 10 categories: Commissions & Fees, Offering of Investments, Platforms & Tools, Research, Customer Service, Mobile Trading, Ease-of-Use, Education, Order Execution, and Banking. All categories, with the exception of "Banking," are factored in to the overall ranking. Star ratings are out of five possible stars and are based on a calculation that combines the variable assessment with an opinion score from 1-10 with 10 "very good" in StockBrokers.com's opinion. Best in Class are online brokers who have placed within the Top 5 for a category. Industry Awards are awarded based on the opinions of StockBrokers.com. Read our 2018 Online Broker Review. For further information on how the ratings were calculated, see StockBrokers.com's "How We Test".